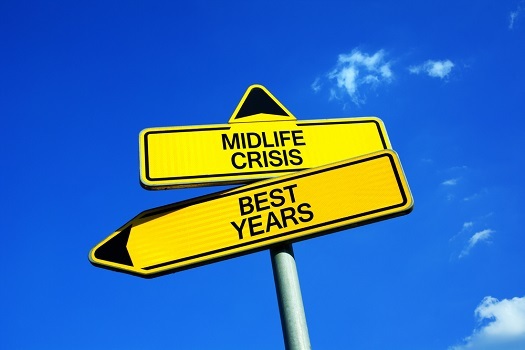 It turns out the myth of the midlife crisis could have some basis in reality. According to a new analysis of life satisfaction published in The National Bureau of Economic Research, there is a generalised U-shape for happiness experienced over the course of a lifetime. While people are generally pretty satisfied in their teens and 20s, things start to get worse in the 30s and 40s. Subjective life satisfaction bottoms out in the 40s or 50s depending on location, with happiness rebounding from there into old age and retirement. During the dark days, a midlife crisis is much more likely to happen. According to the paper's authors, David G. Blanchflower and Andrew Oswald, "There is much evidence that humans experience a midlife psychological low." While the exact causes of this aren't clear, one common explanation is due to stress. During the late 30s and 40s, people may simply be doing too much - raising kids, purchasing property, and trying to set up a career. While these years are not as carefree as those that have gone before, they're also not as relaxing as those yet to come. According to Christina Bryant, psychology of ageing researcher from the University of Melbourne, the happiness curve doesn't have the same effect on everyone: "There would be a lot of people that would actually say mid-life is in fact a relatively stable time in terms of personality and in terms of mental health symptoms... It can also be a time when there is quite a lot of satisfaction for people if they're reaching the peak of their careers, or seeing their children become independent and so on. I think it's a quite a mixed picture." The picture also differs between countries, with those countries that rank among the lowest in happiness having a turning point at an older age. For example, relatively happy countries like Australia, the United Kingdom and Denmark have a turning point around 44 years of age. In contrast, nations such as Russia, Poland and Kosovo can have turning points well into their 60s, and in the case of Russia, as late as 75. This is bad news for people in these countries because they also have a lower life expectancy. According to Associate Professor Bryant, as we age, we "develop cognitive abilities that enable us to deal with life better... We tend to think that from youth to mid-life is a sort of upward trajectory and then after that it kind of goes downhill... But our capacity for more complex thinking keeps on developing right through mid-life, and it's part of that capacity for more complex thinking that also enables us to have a more nuanced view of life, and be happier and more contented about it."